High-Intensity Interval Training (HIIT) has “swiffered” the nation in the past decade or so and remains one of the top hot topics of the fitness world. We also use terms such as Metabolic Condition (MetCon), Metabolic Resistance Training (MRT), and Energy System Training to categorize this high-octane method of training. You may know MetCon best by the crazy stuff you do that makes you feel absolutely exhausted, but invincible. WARNING: It should never be the goal of any MetCon training session to end up in a sweaty pile of your former self. You should be upright and feeling invigorated and not annihilated. The health and fitness benefits of this style of training are numerous! Benefits are mainly fat loss, an increase in energy demand (calorie burn) during and even after the training session, and even an increase in your aerobic capacity, just to name a few. But just like any other style of training (strength, power, endurance), it can be easy to fall into a rut in the methods and exercise selection of your MetCon training session. Here are a few simple and fun ways to change up and spice up your metabolic conditioning training session. REMEMBER: Training can be simply defined as providing a stimulus that forces the body to adapt resulting in change (for example, increased calorie and oxygen use). So to alter a training session, think of manipulating the stimulus. It’s comforting to stick to pieces of equipment we know best and have used many times for our training purposes. But you are doing yourself a disservice by not adding in new pieces that usually come with new adaptions. Battling ropes, rowing ergs, kettle bells, medicine balls, and my personal favorite the Airdyne bike are all great tools that can be used to manipulate the stimulus. These are also the things that make this style of training so much fun. The body will be forced to adapt, triggering the affects you are looking for. The intensity of your training session of course plays a huge role in achieving the desired outcomes. Many metabolic conditioning sessions are based on time as a measurement of intensity and duration. For example, I am sure you are familiar with the Tabatta protocol of 20 seconds of max work followed by 10 seconds of rest for 8 rounds. Many time combinations are used (depending on your fitness level and program progressions), such as :30/:30, :40/:20, and :45/:15. Using time is great, but it could get monotonous, leading to decreased effort and lack of enjoyment. A great alternative is using calorie goals to set your interval as with a rowing erg, or the Airdyne bike (there it is again!). Racing to a predetermined distance is a great way to spice things up as well. Lastly, using repetitions and repetition ladders (10, 9, 8, 7,…1) allows you to simply count your way to completion and can be used with minimal equipment such as one kettlebell or a resistance band. One of the easiest ways to get more out of your metabolic conditioning session is to simply change up your environment. Going outside is a great start when manipulating this training variable. Grab your equipment, get after it, and get some vitamin D all at the same time. On your way outside, invite some of your friends and training buddies to join you. Make the workout more of a competitive challenge to help redefine what you once thought of as limits. Research has proven that you work harder and enjoy training while in a group setting. Use the power of a strong group to get more out your training session. TRY THESE: Here are 2 sample MetCon training sessions using some of the preceding tips. Race to 10 calories resting for 5 calories and try to complete as many rounds as possible in 10 minutes. Get outside, get a group, and complete the following as quickly as you can. Working from 10 Kettle Bell Swings, 10 Goblet Squats, 10 Push-ups down to 1, but the swings will always be 10. 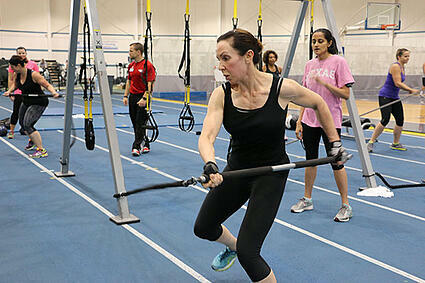 This blog was written by Tony Maloney, Health Fitness Specialist and Fitness Center Manager. To find out more about the NIFS bloggers, click here.